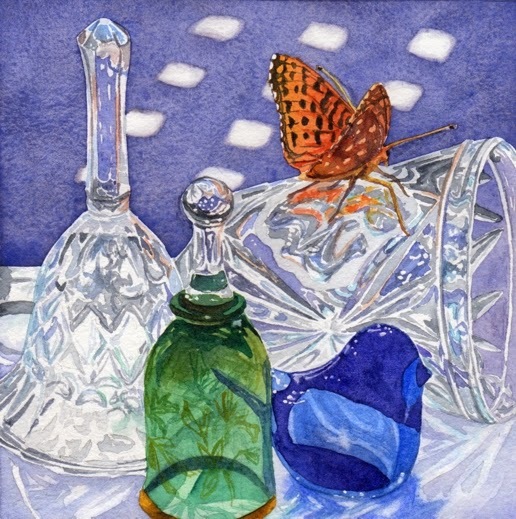 Day 20 of the 30 Paintings in 30 Days and I decided to tackle some glass objects. These are some of the bells that I collected for a while and the blue bird is a statue that my grandmother had. I am actually surprised that I was able to finish it in one day. Because of the time constraints I didn't get as picky with all the little shapes inside each bell. But, painted in more general shapes and worried more about the values. I only masked a few little spots and that also saved some time. I just painted around the white areas using a brush with a very fine tip. The green bell was painted with one of my new favorite colors - Ultramarine Turquoise. The photo was taken outside and I found some good shadows from a deck chair to give interest to the background. I have a new class list out on my website. Two of the classes still have room and will be starting in the next couple of weeks. For more information see my CLASS LINK.